While we don’t know much about Gus’ history, except that he was raised as a pet before he was given to a sanctuary in Texas in 1990.  He quickly became one of the most memorable gibbons once he arrived at IPPL in 2007. 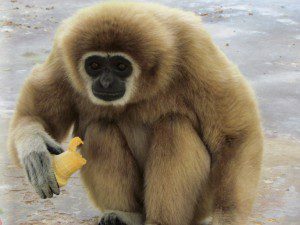 He is a strapping and handsome gibbon and is often seen performing some of the most amazing acrobatic feats. He has a routine he performs when he is very excited where he jumps through a hanging tire, swings off his trapeze, grabs the side of his enclosure, and shakes the bars vigorously. He certainly lets the other gibbons know he is there! Gus can be quite temperamental but when he’s in a good mood he loves interacting with the animal care staff. He will sit and wait patiently for their attention, resting his chin on the bars of his enclosure and pooching his lips out. One of his favorite treats is his evening banana and he is known for stealing handfuls of unattended bananas if they are within reach! While he doesn’t have a mate, he is very close with his neighbor Blackie. The two of them will poke each other playfully through their enclosures when one isn’t paying attention. They will even grab food from their buckets at meal times and sit near each other while they eat. Luckily Blackie’s mate Chloe isn’t jealous of their bromance!